For those of you who thought this blog had officially fallen off the face of the earth (and I’ll include myself in that group), good news, I’m back. I have to admit, it seems weird sitting down and trying to write again after this much time has passed, trying to pick up where I left off. I don’t even know if that’s possible. So much has changed. Honestly, I didn’t know when I would be able to get back to my daily blogging. After all, one of my biggest fans, my mother-in-law Diane, is suddenly very absent from my audience. Seems strange, writing when there is such a gaping hole. When I used to miss a day writing, she would always call or email, just to make sure everything was okay, or to make sure that her computer was working, or that the internet hadn’t swallowed up my blog overnight. If you want to know the truth, I really haven’t felt much like writing lately. Yes, I’m busy, between settling my daughter into a new schedule that includes preschool, and Sunday School, and a return to potty training. And then there’s all the photos, thousands of photos, that I shot for clients over the summer that need to be culled and processed and uploaded. And after that, there’s time to spend with my hubby and time to keep trying to settle in and get this house in order. Sure, I still have a lot of ideas swimming around in this brain of mine–I don’t think I could turn those off if I tried. But I just haven’t been able to motivate my hands to translate the thoughts onto a blank page or screen. I don’t know what it was about today, but I finally started to feel the itch again, like I just needed to get some things down, gets some thoughts out and onto a page in front of me. Get this darn blog started back up again since things are still moving along here. Today, for instance, we finally took care of something that we’ve been talking about since we moved into this house 10 months ago…we sold our couch. Sounds lame to you, I know. But believe me, we haven’t been this excited since our daughter was born 2 1/2 years ago. See, we’re not lazy people by nature, but we have a tendency to get distracted, especially when life throws us as many curveballs as it has this year. When we moved into this house last December, we realized immediately that the big sectional couch we’d bought just after Cadence was born was not going to fit in our new living room. In fact, we moved the corner piece out into the garage and wrapped in a tarp almost immediately because we simply didn’t have room for it. The other two pieces we arranged the best we could, and the semi-worked right up until the day we decided to buy Cadence a giant beanbag (which was well over 4 months ago by now). Still, even though we suddenly had absolutely no room, we procrastinated. 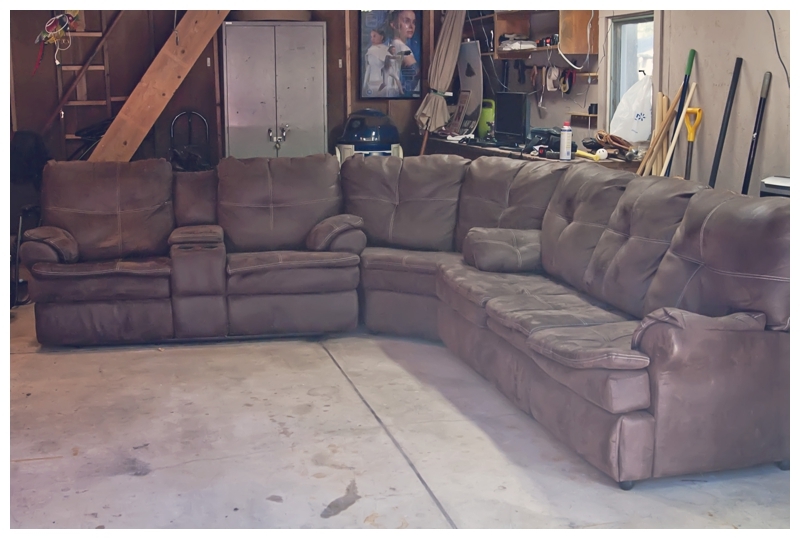 We kept talking about what a great idea it would be to move the couch out to the garage and list it on Craigslist, but still it just didn’t get done. Until Sunday, when we finally decided enough was enough, and we got up early to carry the sofa bed and theater seat sections out to the garage to join the lonely corner piece. Now, I’ll fully admit, I’ve always been semi-skeeved out buying used furniture, especially from total strangers. See, I know what happens on furniture, intentionally and accidentally. And I don’t care how clean or fresh-smelling someone’s house is, any couch, loveseat, recliner, or other upholstered piece of furniture designed for long periods of sitting eventually starts smelling vaguely of stale farts. And their ain’t no Febreze formula that’s gonna get that smell out. Cat puke? Yes. Rotten milk? They’ve got that one covered. Stale farts? They’re still working on that one. Since we bought the couch, we’ve taken really good care of it. After all, it was the first piece of real furniture either one of us had ever bought…well, except our king size bed, but that was just a mattress, box springs, and run of the mill frame. No headboard or dresser or matching end tables. Just the basics. The couch though, we wanted something nice, something that would last, something that we didn’t inherit as a hand-me-down or buy used or pick up by the side of the road on a whim. So yeah, we wanted to take care of it, and I’d like to say we’ve done a pretty good job. Sure, we’ve had the occasional mishap. After all, we have hosted several Superbowl parties, adopted a dog, and added a child to the mix. Short of Saran Wrapping every surface in our house, there was really no way to avoid ever spilling anything on our prized piece of furniture. But lucky for us, we chose microfiber and managed to catch every spill quick enough to avoid any permanent damage. It was a damn fine-looking piece of furniture, and we were both pleased that we were getting hits almost as soon as we placed the ad on Craigslist. Now, given my track record (and increasingly short fuse) with Craigslist scammers, I scanned through the emails and replied to the people who seemed to be the most legitimately interested. I politely turned down trade offers for riding lawnmowers and mini-bikes, and sent texts and messages to people containing the dimensions of the pieces, more detailed descriptions of their condition, and even snapped a few more photos. After getting a good offer, exchanging several emails, and setting up a meeting with one nice young couple (who happened to know several old family and high school friends, how’s that for a small world? ), we were confident that we’d finally found our couch a new home. And thank goodness I gave the sectional one last once over, otherwise it may not have made such a good first impression. 1. Every surface of your house, car, and clothing will eventually come into contact with some sort of liquid or semi-liquid being expelled from someone else’s body. 2. Even when you have hidden something so well that even you can barely remember where you put it, you can be assured that it will in fact be found, played with, slobbered on, and eventually squirreled away in a place where even a certified psychic, a pack of bloodhounds, and a real-life Sherlock Holmes couldn’t find it. And let me tell you folks, if you own a couch, you can pretty much count on it being at the very eye of the aforementioned hurricane. Upon close last-minute inspection of our sectional, I opened up the two back panels of the theater seats that we had completely forgotten about. Not only did I find every strand of hair our dog has apparently shed for the last 31 months, I also discovered the super secret hiding place for used crayons, uneaten Cheerios, bouncy balls, various pieces of plastic food, and the remains of Jimmy Hoffa. I’ve already called in Mulder, Scully, and the members of the Fringe Division, and the working theory at the moment involves an intricate web of time travel, alternate dimensions, and something resembling the Bermuda Triangle. 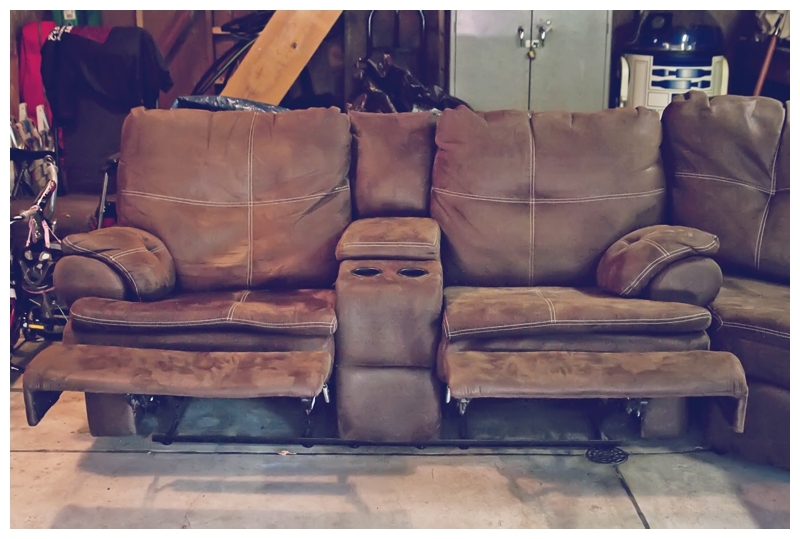 After a thorough vacuuming and removal of all things kid or dog-related and edible, the couch was finally ready to head off to its new home, and its new owners were grinning from ear to ear when they drove away. I gotta say, it felt good letting go.